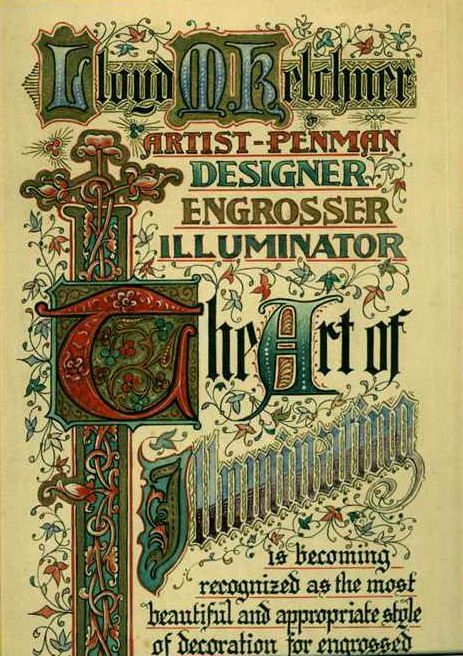 One of the finest all around penmen who ever took pen to ink, Lloyd Kelchner's work in ornamental penmanship, pen art illustration and offhand flourishing served as an inspiration to thousands of individuals for 60 years. Well into his eighties, he continued to produce exquisite work. Born in Light Street, Pennsylvania, Mr. Kelchner's skills in writing were developed while attending G. W. Michael's Pen Art Hall in Oberlin, Ohio in the early 1880's. It was in 1883 that he met C. P. Zaner and E. W. Bloser, fellow students with Kelchner at Michael's school. Four years later, Kelchner and Bloser secured positions and taught in Delaware, Ohio, and later, both men worked at the Euclid Avenue Business College in Cleveland. A strong friendship grew between these men and Zaner that lasted their lifetimes. In 1889, Lloyd Kelchner purchased a half interest in the Zanerian College of Penmanship in Columbus, Ohio which had been established the year before by Mr. Zaner In 1891, Mr. Bloser came to Columbus and purchased a third interest in the Zanerian. The partnership ran for almost a year when Kelchner sold his interest and left for Dixon, Illinois to teach in the Northern Illinois Normal College. He then accepted a teaching position at the Highland Park College in Des Moines, Iowa. The year 1909 is recorded as the point in Kelchner's career when he moved to Seattle, Washington and became a teacher in the Seattle Business College. He remained in Seattle the rest of his life. Over the years he taught thousands of students engrossed countless resolutions, and lettered the names on many thousands of diplomas. He contributed articles, lessons, and samples of his own work to various penmanship magazines, particularly the Business Educator, for several decades, and was particularly known for his unique style of bird flourishing. Each year for over 40 years he made a tradition of designing his own Christmas cards. These colorful cards featured beautiful penmanship and dramatic bird flourishes, and were prized by his friends and associates. Lloyd Kelchner kept in close contact with the penmanship profession, maintaining strong friendships and earning the respect of penmen everywhere. He passed away after a short illness on July 5, 1948.